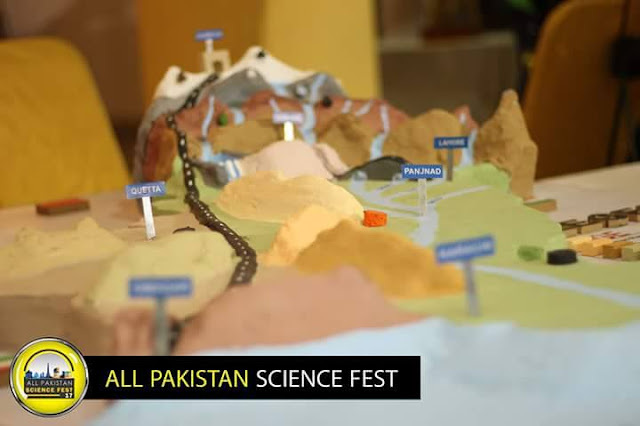 It is fascinating to watch folds form and develop in the laboratory, and we can learn much about folds and folding by performing controlled physical experiments and numerical simulations. However, modelling must always be rooted in observations of naturally folded rocks, so geometric analysis of folds formed in different settings and rock types is fundamental. 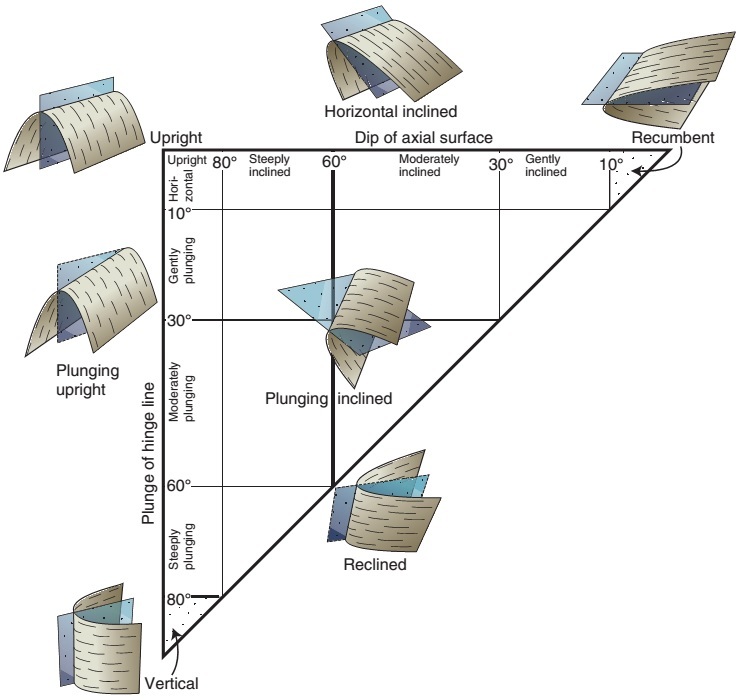 Geometric analysis is important not only in order to understand how various types of folds form, but also when considering such things as hydrocarbon traps and folded ores in the subsurface. There is a wealth of descriptive expressions in use, because folds come in all shapes and sizes. Hence we will start this chapter by going through the basic jargon related to folds and fold geometry. Folds are best studied in sections perpendicular to the folded layering, or perpendicular to what is deﬁned as the axial surface. In general, folds are made up of a hinge that connects two usually differently oriented limbs. The hinge may be sharp and abrupt, but more commonly the curvature of the hinge is gradual, and a hinge zone is deﬁned. A spectrum of hinge shapes exists, from the pointed hinges of kink bands and chevron folds (sharp and angular folds) to the well-rounded hinges of concentric folds. Classiﬁcation of folds relative to hinge curvature is referred to as bluntness. The shape of folds can also be compared to mathematical functions, in which case we can apply terms such as amplitude and wavelength. Folds do not necessarily show the regularity of mathematical functions as we know them from classes of elementary algebra. Nevertheless, simple harmonic analysis (Fourier transformation) has been applied in the description of fold shape, where a mathematical function is ﬁtted to a given folded surface. In multi-layered rocks, folds may be repeated with similar shape in the direction of the axial trace. Such folds are called harmonic. If the folds differ in wavelength and shape along the axial trace or die out in this direction they are said to be disharmonic. The point of maximum curvature of a folded layer is located in the centre of the hinge zone and is called the hinge point. Hinge points are connected in three dimensions by a hinge line. The hinge line is commonly found to be curved, but where it appears as a straight line it is called the fold axis. This takes us to an important element of fold geometry called cylindricity. Folds with straight hinge lines are cylindrical. A cylindrical fold can be viewed as a partly unwrapped cylinder where the axis of the cylinder deﬁnes the fold axis. 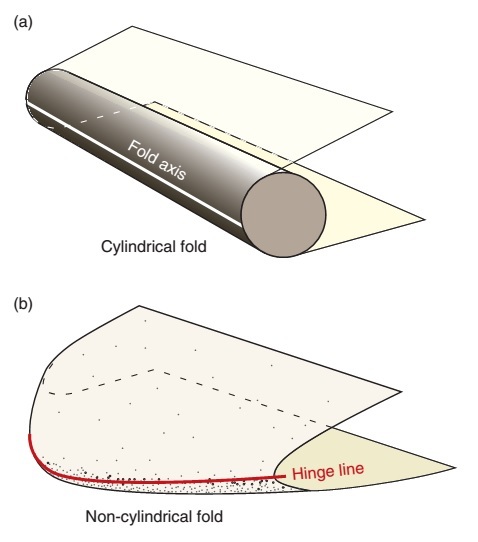 At some scale all folds are non-cylindrical, since they have to start and end somewhere, or transfer strain to neighbouring folds, but the degree of cylindricity varies from fold to fold. Hence, a portion of a fold may appear cylindrical as observed at outcrop, even though some curvature of the axis must exist on a larger scale. Cylindricity has important implications that can be taken advantage of. The most important one is that the poles to a cylindrically folded layer deﬁne a great circle, and the pole (p-axis) to that great circle deﬁnes the fold axis. When great circles are plotted instead of poles, the great circles to a cylindrically folded layer will cross at a common point representing the fold axis, in this case referred to as the b-axis. This method can be very useful when mapping folded layers in the ﬁeld, but it also works for other cylindrical structures, such as corrugated fault surfaces. Another convenient property of cylindrical folds is that they can be projected linearly, for example from the surface to a proﬁle. Cylindricity is therefore commonly assumed when projecting mapped structures in an area onto cross-sections, particularly in the early 1900 mapping of the Alps by Swiss geologists such as Emile Argand and Albert Heim. Since the validity of such projections relies on the actual cylindricity of the projected structures, the uncertainty increases with projection distance. The axial surface, or axial plane when approximately planar, connects the hinge lines of two or more folded surfaces. The axial trace of a fold is the line of intersection of the axial surface with the surface of observation, typically the surface of an outcrop or a geologic section. The axial trace connects hinge points on this surface. Note that the axial surface does not necessarily bisect the limbs. It is also possible to have two sets of axial surfaces developed, which is the case with so-called box folds, which are also called conjugate folds from the characteristic conjugate sets of axial surfaces. In other cases, folds show axial surfaces with variable orientations, and such folds are called polyclinal. The orientation of a fold is described by the orientation of its axial surface and hinge line. These two parameters can be plotted against each other, and names have been assigned to different fold orientations. Commonly used terms are upright folds (vertical axial plane and horizontal hinge line) and recumbent folds (horizontal axial plane and hinge line). An antiform is a structure where the limbs dip down and away from the hinge zone, whereas a synform is the opposite, trough-like shape. Where a stratigraphy is given, an antiform is called an anticline where the rock layers get younger away from the axial surface of the fold. Similarly, a syncline is a trough-shaped fold where layers get younger toward the axial surface. We can even have recumbent synclines and anticlines, because their deﬁnitions are related to stratigraphy and youngish direction. However, the terms recumbent and vertical antiforms and synforms have no meaning. Imagine a tight to isoclinal recumbent fold being refolded during a later tectonic phase. We now have a set of secondary synforms and antiforms. The younging direction across their respective axial surfaces will depend on whether we are on the inverted or upright limb of the recumbent fold. 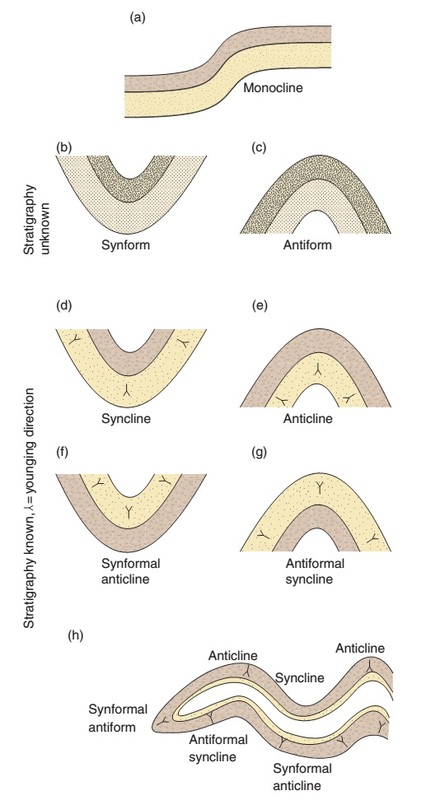 We now need two new terms, synformal anticline and antiformal syncline, to separate the two cases. A synformal anticline is an anticline because the strata get younger away from its axial surface. At the same time, it has the shape of a synform, i.e. it is synformal. Similarly, an antiformal syncline is a syncline because of the stratigraphic younging direction, but it has the shape of an antiform. Technically, a synformal anticline is the same as an anticline turned upside down, and an antiformal syncline looks like an inverted syncline. Remember that these terms only apply when mapping in polyfolded stratigraphic layers, typically in orogenic belts. As already stated, most folds are non-cylindrical to some extent. A non-cylindrical upright antiform is sometimes said to be doubly plunging. Large doubly plunging antiforms can form attractive traps of oil and gas - in fact they form some of the world’s largest hydrocarbon traps. When the non-cylindricity is pronounced, the antiform turns into a dome, which is similar to a cereal bowl turned upside-down. Domes are classic hydrocarbon traps, for example above salt structures, and geoscientists commonly talk about such traps as having a four-way dip closure. Correspondingly, a strongly non-cylindrical synform is in fold terminology called a basin (the cereal bowl right-way up). A monoclinal fold is a sub-cylindrical fold with only one inclined limb. 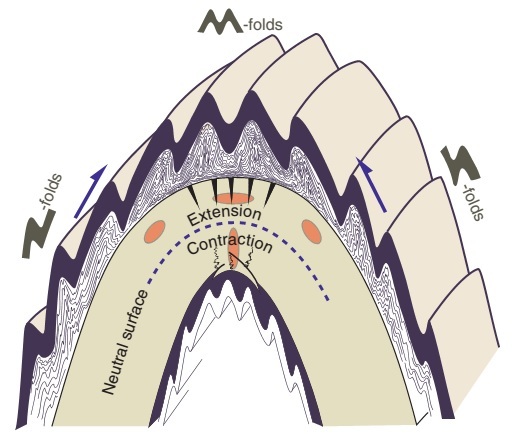 Monoclinal folds (or just monoclines for short) are commonly found as map-scale structures related to reactivation of, or differential compaction across, underlying faults or salt structures. In addition to orientation and stratigraphic relations, folds are commonly described or classiﬁed according to tightness. Tightness is characterized by the opening or interlimb angle, which is the angle enclosed by its two limbs. Based on this angle, folds are separated into gentle, open, tight and isoclinal. Tightness generally reﬂects the amount of strain involved during the folding. Folds usually come in groups or systems, and although folds may be quite non-systematic, neighboring folds tend to show a common style, especially where they occur in rows or trains. In these cases they can, akin to mathematical functions, be described in terms of wavelength, amplitude, inﬂection point and a reference surface called the enveloping surface. The enveloping surface is the surface tangent to individual hinges along a folded layer. Class 1: Dip isogons converge toward the inner arc, which is tighter than the outer arc. Class 2 (similar folds, also called shear folds): Dip isogons parallel the axial trace. The shapes of the inner and outer arcs are identical. Class 3: Dip isogons diverge toward the inner arc, which is more open than the outer arc. Class 1 folds are further subdivided into classes 1A, 1B and 1C. 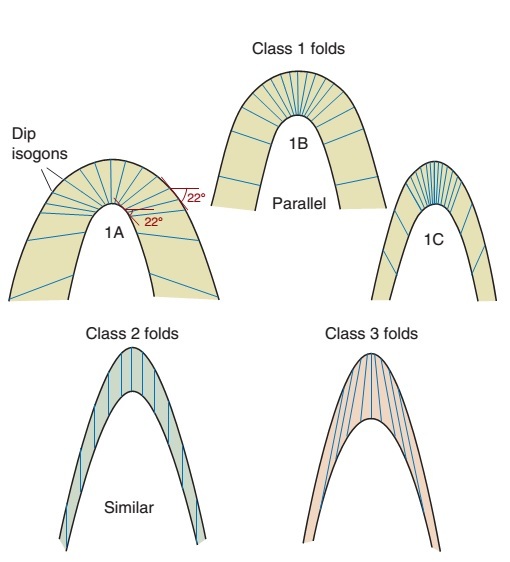 1A folds are characterized by thinned hinge zones, while 1B folds, also called parallel folds and, if circle shaped, concentric folds, have constant layer thickness. Class 1C folds have slightly thinned limbs. Class 2 and, particularly, Class 3 folds have even thinner limbs and more thickened hinges. Among these classes, Class 1B (parallel) and 2 (similar) geometries stand out because they are easy to construct and easy to identify in the ﬁeld. One way of plotting folds according to the dip isogon classiﬁcation, where folds are considered as upright structures (vertical axial planes), so that the dip of the limb (a) increases in each direction from 0 at the hinge point. This is the thickness measured orthogonal to the layer at one of the two corresponding points of equal dip on each arc. Folds can be symmetric or asymmetric in cross-section. A fold is perfectly symmetric if, when looking at a cross section perpendicular to the axial surface, the two sides of the axial trace are mirror images of one another. This implies that the two limbs are of equal length. The chevron folds and concentric folds are examples of symmetric folds. If we extend this concept to three dimensions, the axial plane becomes a mirror plane, and the most symmetric folds that we can think of have two other mirror planes perpendicular to the axial plane. This is the requirement of orthorhombic symmetry. For symmetric folds the bisecting surface coincides with the axial plane. In fact, this is how we distinguish between kink bands and chevron folds: chevron folds are symmetric while kink bands have one long and one short limb. This leaves us with one symmetry (mirror) plane only, the one perpendicular to the axial surface, and the symmetry is said to be monoclinic. Symmetric folds are sometimes called M-folds, while asymmetric folds are referred to as S-folds and Z-folds. Distinguishing between S- and Z-folds may be confusing to some of us, but Z-folds have short limbs that appear to have been rotated clockwise with respect to their long limbs. Z-folds thus mimic the letter Z when considering the short limb and its two adjacent long limbs. S-folds imply a counter-clockwise rotation, and resemble the letter S (this has nothing to do with the difference in angularity between S and Z). Interestingly, S-folds become Z-folds when viewed from the opposite direction. Plunging folds are usually evaluated when looking down-plunge, while viewing direction must be speciﬁed for folds with horizontal axes. Fold systems consisting of folds with a consistent asymmetry are said to have a vergence. The vergence can be speciﬁed, and the vergence direction is given by the sense of displacement of the upper limb relative to the lower one. We can also relate it to the clockwise rotation of the inclined short limb,where a clockwise rotation implies a right-directed vergence. Fold vergence is important in structural analysis in several ways. Large folds tend to have smaller folds occurring in their limbs and hinge zones. The largest folds are called the ﬁrst-order folds, while smaller associated folds are second and higher order folds. The latter are also called parasitic folds. First-order folds can be of any size, but where they are map scale we are likely to observe only second- or higher-order folds in outcrops. If a fold system represents parasitic (second order) folds on a ﬁrst-order synformal or antiformal structure, then their asymmetry or vergence indicates their position on the large-scale structure.This relationship between parasitic and lower order folds can be extremely useful for mapping out fold structures that are too large to be observed in individual outcrops. The vergence of asymmetric fold trains in shear zones is generally unrelated to lower-order folds and can give information about the sense of shear of the zone. Such kinematic analysis requires that the section of observation contains the shear vector and should be used together with independent kinematic indicators. Fold asymmetry may relate to position on a lower-order fold, sense of shear or orientation of the folded layer relative to the strain ellipse.